Most businesses advertise, especially when they are trying to grow or fend off competition. Advertising is not cheap, particularly the sort of advertising large companies find necessary to make an impact. Thus, it is easy to imagine that most companies would love the idea of a viral ad that wildly outperformed what could be expected based on the money they paid for it. Now imagine how fortunate a company would be if they were able to obtain more publicity than even a viral ad could produce without spending a dime. If a large company could manage to get a group of people, preferably a small group that claimed to represent a much larger group but did not actually do so, to boycott them for a reason most people would find incredibly silly, they just might be able to pull this off. 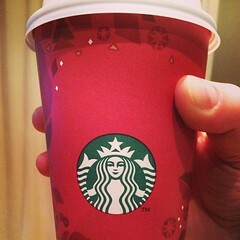 Case and point: Starbucks and their red holiday cups. The number of people who are genuinely outraged by the red cups and actually willing to boycott Starbucks because of them is almost certainly minuscule. And yet, they suggest that they are representing Christians, a vast and extremely powerful group in the U.S. Of course, they aren't. Most Christians find this outrage quite silly. This is a massive win for Starbucks because it means that there is little danger of boycott large enough to negatively impact their business, most people find the outrage ridiculous but can't seem to stop talking about it, and they receive all the free publicity they could want as a result. It is difficult to imagine a more effective advertising campaign could be produced even if the company decided to throw lots of money at it. Perhaps Starbucks orchestrated this whole thing. Maybe they paid some people to set this in motion. If so, they should be commended for a brilliant campaign. Then again, it is not hard to believe that some Christians really were outraged and did not need any convincing to do this. It isn't like this would be the first time that some small group of Christians boycotted something they perceived as undermining their privilege. Some members of the Christian right seem to be every bit as fond of outrage, boycotts, and efforts to harm their opponents as do some members of the regressive left. Maybe this is yet another example of real outrage rather than bought-and-paid-for outrage. In any case, kudos to Starbucks. They are now in an ideal position to ride this publicity as far as it will take them. I have little doubt that the few people who might actually boycott them will easily be eclipsed by the many more who will go out of their way to support them as well as the free publicity they have been receiving.